What is a card watcher? 1. What is a card watcher? Watching cards allow users to receive notifications for any changes that have been made on a certain card, even if they are not subscribed to get notifications from the board where the card is located. For example: if you are part of the sales team, but you would like to get updated on the status of a feature development task, you can become a Card watcher for the card. You will get notifications about all card events and progress updates. 2. How to add a card watcher? You can add yourself as a card watcher, but the system also allows you to make a card watcher any of your team members. 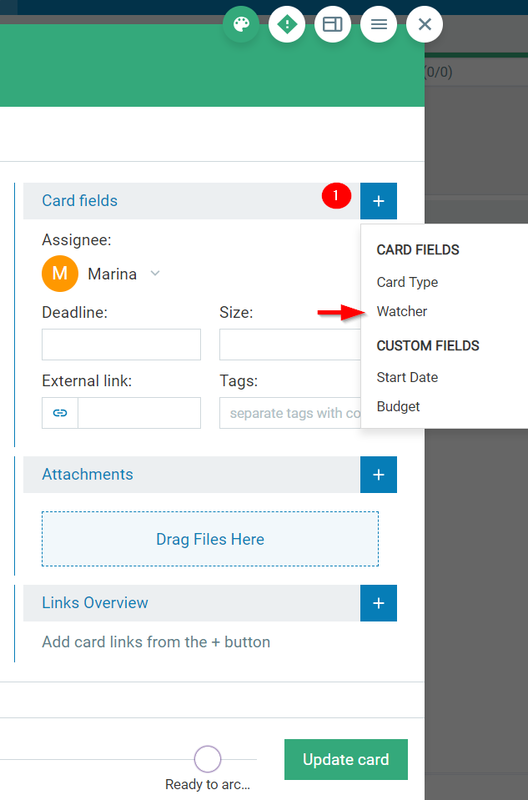 2.1 Open the card and select the plus icon that belongs to the Card fields -> then select Watcher (img.1). If you want to remove a watcher from a card, use the same navigation → click on the x-button next to the Watcher's name and click on Update card to save the changes. 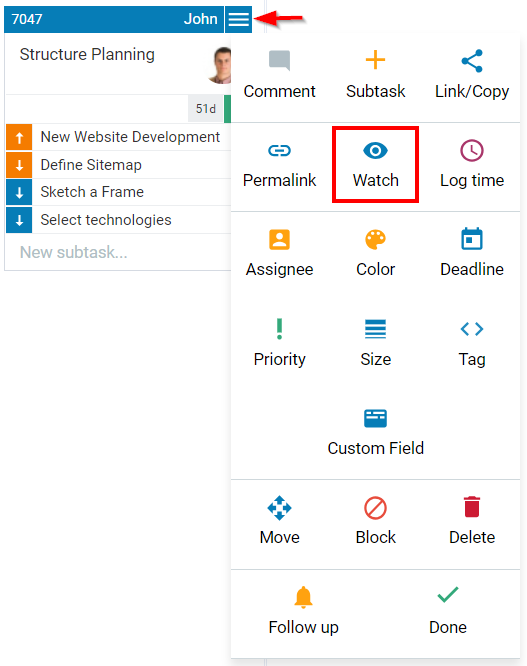 2.2 Open the card Context menu and select Watcher (img.2). Using this option you can add only yourself as a watcher to a card. If you want to stop watching a card, use the same navigation and select: Stop Watching. Note: Account Owners can watch a card even if they are not assigned to the board where the specific card is located.